Filtration system This filtration system uses fine filter (MF filter) and activated charcoal. 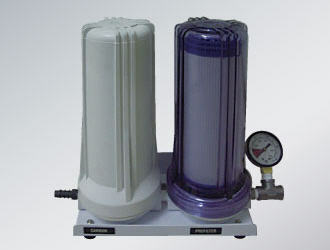 ● It is compact size raw water filter using activated charcoal and MF filter. ● This system can remve chlorine from tap-water or well water by conecting to water pipe, and water can be used as cultivation water. ● This compact filter can be placed anywhere.